The Text Festival occupies the boundaries between art and poetry, examining the response of text artists and poets to the substantial ambiguity of language. A 12 week programme of events held in Bury, Lancashire, featuring exhibitions, public art commissions, publications and performances by internationally recognised practitioners and some of the newest talents in the field. This is the major British festival based on the idea that art can be read as poetry and poetry can be viewed as art. Text Festival Programme Announced: two major American poets perform at the Festival: headlining Ron Silliman’s first ever reading in the UK plus renowned visual poet Geof Huth. Commissioned Bury poems by UK writers Phil Davenport, Carol Watts, Tony Lopez, performed on 2nd May 2pm Bury Met Art Centre. Please visit http://www.textfestival.com/ to find out more. arthur+martha are delighted to feature in an article in today's Guardian (Society section, page 2) about their experimental work in the arts and health field, particularly with older people. Since the organisation launched in 2006, they have pushed at the boundaries of poetry and art, collaborating with people in hospitals and care, to create intricate patchworks of memory, humour, playfulness and sadness. arthur+martha projects include the recent holocaust memorial animated textworks shown on the electronic billboard at Piccadilly Railway Station and their current exhibition Paracetamol Soup at Central Library, Manchester (until 6th May). 'The artists don't mind that the older people sometimes see them as "a bit daft", and the results of their collaboration are often amusing. 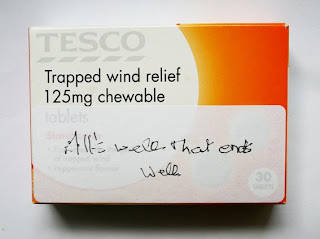 A packet of generic wind relief tablets was cheekily relabelled: "All's well that ends well." And a postcard bears the words: "Skint. Send cheque immediately (If this is dying, I don't think much to it)." Leading a workshop where we looked at holidays as a way to explore how it feels to be in hospital made me realise how difficult it is getting the balance right; the balance between the visual and the words, between a good workshop for those involved and a good art piece for others, between finding a theme for the sessions that is accessible and also challenging. What arthur+martha does, achieves this. Overall this exhibition presents pieces of work where the subject matter, the words and the visual all tie together. Like the matchbox faces, where the words and pictures concertina out, we are encouraged to look beyond the surface. The depth of these pieces reminds us of the complexity of these people's lives. While the sticky labels on the medication makes the work appear less finished, this work takes you along a journey from their childhood to the specifics of their lives now. The work captures the huge array of experiences and emotions that these people have had and continue to have. The wavering handwriting on the sock labels touches on the aging process with a stark comparison between the old and young. But these lines also talk of the frustration of not being able to communicate their thoughts and of their determination to do so. Displayed in glass cabinets alludes and contrasts with images of menageries full of fragile relics to delicate to be touched, once again challenging our assumptions of the elderly. Like the title suggests, this work is a soup that mixes experiences and emotions with layers and contrasts. All in the right combinationm this work gives us a powerful taster about these artists lives that leaves us wanting more.